Flip-Up helmets offer you the choice between riding with a full face or open face helmet with the flick of your wrist making them a versatile style that is growing popularity every year. With your safety as our priority, we only supply helmets that have been officially certified by respected governing bodies meaning our entire range of road helmets is minimum ECE 22.05 certified. All our helmets come with Free UK Delivery and free Exchange. The E225 from 3GO helmets is a great addition to the 3GO range of flip up helmets at a price which makes this lid irresistible for any biker looking for an all purpose helmet packed with features. The 3GO E225 takes comfort seriously with the noise reducing high density internal lining, inner drop down sun visor, aerodynamic venting system helping you to concentrate on those longer rides. 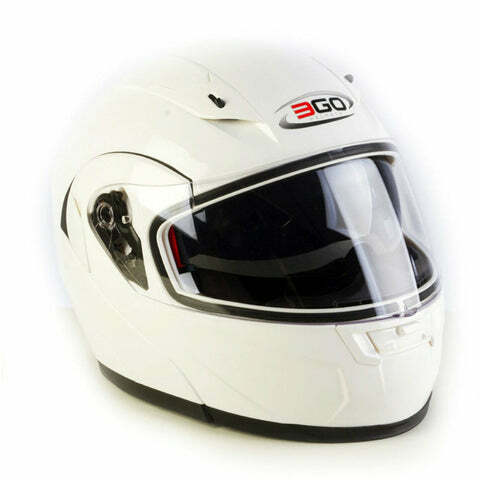 3GO is a premium line of helmets from renowned helmet brand Viper offering sleek styling, solid colours, and huge spec. 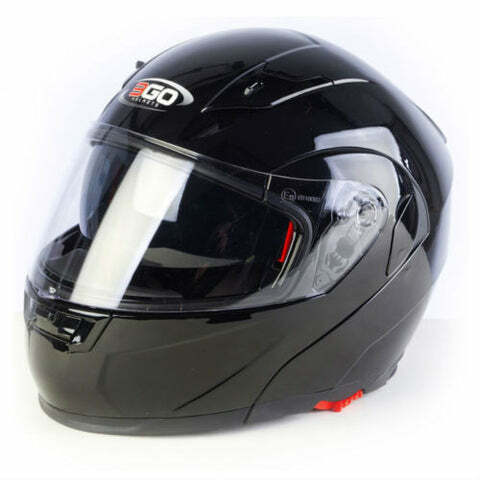 Lightweight shells with acclaimed safety make 3GO a big name in mid range motorcycle helmets. Our range of flip up helmets features a style for every type of rider with brands such as HJC, Stealth, Duchinni and more meaning you can find the right flip up helmet for you no matter what your budget. Thanks to modern technology and high tech materials, helmet manufacturers are able to design and build flip up helmets that not only meet the required ECE 22.05 certification but surpass it with many 5 star rated helmets in our range. Because of the versatility of these helmets and the multi purpose approach of most riders who use one, it’s very common to have an integrated drop down sun visor in flip up lids, to help reduce the suns glare and to protect your eyes when the helmet is in the up position.